Misool Foundation's Rangers guard local beaches which are nesting sites for endangered Green Turtles and Hawksbill Turtles. The Rangers watch over the nests, ensuring their not scavenged by hungry monitor lizards. If a nest hatches during the day, Rangers carefully gather up the hatchlings and keep them safe until after dark, when most of their predators are sleeping. The most perilous time of a turtle's life occurs just after hatching. With your help, we can give the turtles a little boost + increase their chances of survival. Subject to availability: turtle mammas answer to no one. Located about 30 minutes from the resort are the spectacular Wayil Batan islands. These craggy islets of karst fracture off from the large islands, creating a wild labyrinth of turquoise lagoons dotted with small islands. The water is scattered with tiny mushroom-shaped outcroppings draped in pitcher-plants and wild orchids. We'll weave between the islands, stopping to swim in a turquoise blue lagoon. We then make our way onwards to stop for a picnic on a deserted beach before snorkelling on the nearby reefs. On our way home, look out for pods of dolphins and frigate birds hunting the baitballs at the surface. We’ll drop you off on one of our private beaches for an afternoon of romance. Just you + your sweetie on a hidden beach with only the sea, sky, + sand for company. We highly recommend a lazy afternoon with fresh tropical fruits + sparkling wine. Bonus: consider paddling to the beach in a kayak or SUP. We'll provide you with a map to find your secret beach. Standup Paddle Boarding is a great way to experience Raja Ampat's spectacular ecosystem from a new perspective. With the help of Polarised sunglasses, you'll be able to see the reef below as well as the jungle above. We'll shuttle you to a nearby area of lagoons, with dramatic karst limestone formations carpeted with carnivorous pitcher plants and wild orchids. 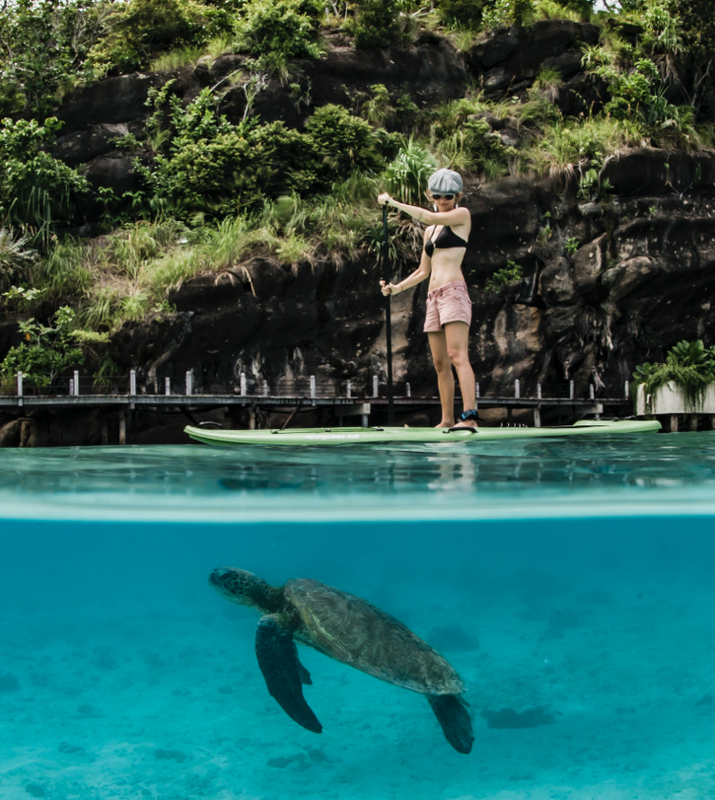 If you're a newbie, we recommend taking an SUP for a spin in the lagoon before we set out for a longer tour. It's much easier than it looks! Tour a traditional Papuan village, about 1 hour northwest of our resort island. You will be escorted by one of our staff who come from this small village, which is built mostly on stilts over the sea. Much of everyday life here takes place outside - you can expect to see lots of friendly and curious faces, betel nuts drying on racks, dug-out canoes being built, nets being repaired, goats, kittens, and children posing for photos. Visit the school, have a look at the mosque, and appreciate how local people live. Allow our chefs to take you on a culinary tour of Indonesia. You'll learn how to use fresh ingredients like turmeric, lemongrass, kaffir lime leaf, pandan leaf, and fresh pressed coconut oil to create a few Indonesian classics such as Sumatran Rendang Curry, Balinese Lemongrass Chilli Sauce, and Coconut Pandan Crepes. This class takes place outside on the terrace, overlooking the North Lagoon.